A group of travellers is still parked up on land in the Norbreck area of Blackpool, causing concern to residents in the area. Around 20 vans moved onto land off Warren Drive on Tuesday night, having re-located from a site on nearby Moor Park, where land owners Blackpool Council took action to have them moved on. The travellers are now camped on an area of private land, opposite the Golden Eagle pub. It is understood this land is owned by supermarket chain Asda, which has so far not commented about the situation. 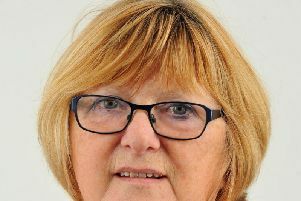 There are concerns that without swift co-operation from the land-owners, it may take more time for Blackpool Council and the police to move the travellers on. Blackpool Council’s environmental department has been liaising with both the police and the landlords to try and resolve the issue. Norbreck councillor Maxine Callow and fellow ward councillor Peter Callow have been in contact with residents who are worried about the travellers. She said: “I have been told that the travellers have been ordering groceries from supermarkets and having them delivered there. “One of the vans was said to be an Asda van, which is very ironic. “The land owners have just left and neglected this site and made no effort with it at all, there are no fences there and no maintenance. “Obviously local residents are concerned, in terms of the numbers of the travellers and the way they will behave on the site. The councillors have also been told that trees have been felled by the travellers, although this has not been substantiated. Coun Callow added; “This area of land has caused so many problems with residents. “There are plans to build 80 houses on there, which have been rejected by planners because it is a flood plane. “But the developers are now appealing again it and that is a great worry to local residents, who are law abiding people and just want to live there in peace. The land borders the Anchorsholme area, and Coun Tony Williams, who represents the Anchorsholme ward, said: “I have always wanted Asda to ‘gift’ the land to both communities so we could use some of our combined ward budgets to clean up the area and make it a conservation park. “The CEO of Asda wrote to me in April this year saying that he would not be gifting this land to the community but would ensure that ‘any maintenance deemed necessary will be undertaken’ after I had written to him complaining of their neglect of this site. “Asda has totally neglected this piece of land for almost twenty years allowing it to become no more than waste land and a dog’s toilet. A Blackpool Council spokesman said: “We went to court to get a direction to leave order, which was issued on Tuesday for the Moor Park site. Asda was approached for confirmation it owns the site, and to comment on the latest situation regarding the travellers, but has not yet responded.